Hello to all our lovely English learners of EC London 30+, I hope you are all doing well and improving your English with us! Today it’s time to talk about food! We know that learning is important but so is food. From food trucks to fine dining spots, London has the best cuisine from all around the globe at a range of prices. Last week, I wanted to try exotic food. Therefore I opted for Korean food, which I never had before, and I can tell you that I do not regret this choice. On the Bab is a Korean street food restaurant located in 36 Wellington St, Covent Garden. Moreover it is only 15 min on tube from our English School for Adults in London. If you do not want to wait for a seat, you can always ask for takeaway, which is convenient if you are on a rush! This restaurant is opened 7 days a week, usually from 11:30 to 22:30 on Mondays to Saturdays and from 11:30 to 21:00 on Sundays. 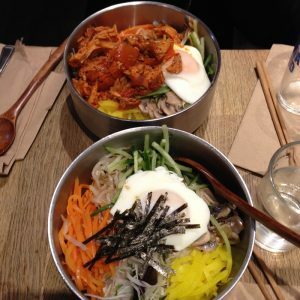 Both, me and my friend ordered Bibimbap for £9.5, which is a Korean rice dish with various ingredients including the meat of your choice. I can say that it was tasty and healthy, the good thing is that we had a set of 3 traditional Korean sauces to add to our Bibimbap, from sweet to spicy. I am sure you will find your happiness! If you have a big appetite you can order Korean side dishes called “banchan”! Nice food, friendly staff and cosy atmosphere, I strongly recommend On the Bab!